George Osborne’s budget was driven by an obvious political imperative but was, in economic terms, largely a non-event. The major interest, such as it was, lay in the minor adjustments offered to long-suffering consumers in the forlorn hope that they would be cheered up by cheaper beer and marginal concessions on income tax, and might not therefore notice that their jobs, services and living standards are still under constant threat. In terms of the wider economy, the Chancellor’s stance was “steady as he goes”; after nearly three years of his stewardship and in the sixth year of recession, nothing much, it seems, needed to change. There was no recognition that austerity as a response to recession had not only been invalidated by experience, both in the UK and in Europe, but had also, as a consequence, been rejected – following a review of their earlier recommendations – by the IMF. The Chancellor was apparently unconcerned that output still lagged behind its pre-recession peak, and that the government borrowing, whose reduction he had identified as one of his primary goals, had continued – reflecting the depressed level of economic activity – to grow as a percentage of GDP. So little account was taken of the most obvious and pressing problems facing the economy that one must wonder whether the Chancellor’s focus is political and social, rather than economic. It may well be that his unstated agenda is to take advantage of the recession to unleash forces and drive through measures that will change the balance of advantage between rich and poor, private business and the public sector, for a generation. The Chancellor may well be, in other words, an (perhaps – if one is being generous) unwitting heir to a long and dishonourable tradition, epitomised by Andrew Mellon, the multimillionaire US Treasury Secretary, who called upon employers in the depths of the Great Depression to “liquidate labour”. Austerity, and the withdrawal of government, represent, after all, increased space for private enterprise (though the Chancellor seems not to have noticed that manufacturing is so enfeebled that it is unable to take advantage of any supposed opportunities); and even the resulting failure to get the economy moving has a silver lining, in that it guarantees that unemployment remains an actual and potential restraint on wage growth. What was needed from the Chancellor in his Budget speech was so far removed from what was in his mind that there seems scarcely any point in rehearsing it. But the Budget speech would have made a positive difference if it had signalled the abandonment of austerity and its replacement by a strategy to recruit government, banking and industry in a joint effort to raise the level of demand, to provide finance for productive investment, to coordinate an industrial strategy focusing on those areas of manufacturing that represent the best possibilities for growth, and to frame a macro-economic policy with competitiveness rather than inflation control at its heart. This article was written for Palgrave Macmillan’s newsletter. George Osborne may be just about the last person in Britain to believe that austerity offers a real path to recovery from recession and the resumption of growth – and it may be doubted that even he remains a true believer. The repeated fall back into recession, a government deficit that goes on rising, and the loss of the country’s top credit rating are surely enough to shake the confidence of even the most arrogant and obtuse practitioner of the dismal science. We now know for sure what Keynes and commonsense always told us – that responding to recession by cutting spending is akin to the medieval practice of blood-letting as a treatment for disorders. The Chancellor’s continued display of commitment to failed policies may, of course, be for public consumption only and it may be that his real purpose is not economic but political and social. His undeclared goal may well be to drive home – at whatever economic cost – changes in the balance between private and public sectors, and rich and poor, that will take a generation to undo. What is undeniable, though, is that in economic terms he has dug himself – and the rest of us – into such a deep hole that there is now no discernible way out. But while his may be the most egregious of all the errors made by successive Chancellors, it would be wrong to overlook the fact that others have also contributed their efforts to digging a hole that has grown ever deeper over four decades or more. My own interest and involvement in these issues goes back to the mid-1970s, when – as a young Labour MP – it seemed clear to me that Britain’s real but unacknowledged economic problem was one of declining competitiveness. We refused to recognise then, and have done ever since, that the world has changed and that the rise of newly competitive economies has meant that we cannot rely on some kind of natural law that guarantees us a higher standard of living than others should enjoy. The competitiveness issue thrust itself centre-stage in 1976 in the form of a fully-fledged sterling crisis; but, true to form, and rather than concede that sterling was then overvalued, the UK exhausted its reserves and virtually bankrupted itself in trying to defend sterling’s parity. The resultant need for an IMF bailout did not arise, as popular (and an oxymoronic right-wing) wisdom often has it, because the Labour government profligately allowed public spending to rise out of control, but because it was determined to defend sterling at all costs. That same determination then dictated our (literally) counter-productive response to the course that the IMF suggested we should follow in order to overcome the crisis. The IMF recommended that monetary policy (which was already assuming greater importance as monetarism became fashionable) should be conducted in terms of Domestic Credit Expansion (DCE); we were free, in other words, to grow the economy as fast as we wished, provided that a credit-fuelled domestic inflation was restrained. This recipe for export-led growth was an explicit recognition that our problem was one of competitiveness and an implicit recommendation that the exchange rate should be lower. The statement was of course a nonsense. There is no remedy for recession that does not involve spending more. Callaghan’s statement would have been more accurate if he had said, “we can’t do what is required to escape from stagflation because our fundamental lack of competitiveness means that spending more would make our inflation and balance of payment problems even worse.” The problem he was trying to describe was really one, in other words, of competitiveness rather than anything else. By the time Margaret Thatcher came to power, supposed monetarist certainties[i] were the order of the day and – with sterling floating and exchange controls removed – the much-heralded benefits of North Sea oil were confidently expected to resolve any balance of trade problems and to usher in a new era of prosperity. But North Sea oil, combined with monetarism and a floating exchange rate, proved a toxic combination. The monetarist prescription made it inevitable that, as North Sea oil output became available, some other area of production should decline – and manufacturing duly obliged. The theory predicted that the discovery of a new source of wealth would inevitably drive up the exchange rate so that other sectors of production were priced out of markets both at home and abroad. It was never explained why this should be inevitable in Britain but not apparent in the case of Norway, a smaller economy where the advent of North Sea oil was proportionately even more important, but where steps were taken to protect the rest of the economy. The Norwegians in fact found ways of insulating the domestic economy against the boost produced to overseas earnings by oil exports and import saving. Many monetarist economists at this time went so far as to work out the level of demand for money of a given economy (incidentally ignoring the significance of the velocity of circulation, which can vary substantially over time). This approach necessarily fixes a given economy in a given condition. The British economy was assumed to have a lower demand for money than the German economy and if this was exceeded, increased inflation was inevitable. This assertion, which was unexplained or unsupported by argument, was necessary to explain the fact that growth in the German money supply ran at a significantly higher level than the British money supply while at the same time permitting the Germans to maintain a stronger growth rate and a lower inflation rate. No attempt was made to explain why this supposedly immutable condition of the British economy should apply. In the same way, each economy was assumed to have a naturally occurring rate of unemployment which could not be changed by policy. A NAIRU, or non-accelerating inflation rate of unemployment, was ascribed to each economy. In the case of the United Kingdom, it was assumed to be relatively high and, more significantly, impervious to attempts to bring it down. In fulfilment of this prophecy, unemployment rose sharply through the 1980s, despite the repeated attempts to massage the statistics downwards. The number of claimants of unemployment benefit jumped from just over 1 million in 1979 to over 3 million in 1986. The UK balance of payments remained in substantial deficit throughout the period, reaching record levels at times in relation to GDP. The deficit reflected, of course, the decline of manufacturing and the deterioration in the balance of trade in wide areas of the productive sector. That in turn reflected the loss of competitiveness, which was shown – but ignored – by the various indices used to measure competitiveness. John Major’s government, supported by Labour, sought to address the continuing economic problems by taking refuge in the Exchange Rate Mechanism, thereby handing responsibility, in effect, for restraining inflation over to a foreign central bank and avoiding – it was hoped – any opprobrium for the price to be paid for such “discipline”. But, true to form, an inappropriate parity and the mistaken analysis that identified inflation rather than a lack of competitiveness as our fundamental problem wreaked such damage that we were eventually forced out of the ERM. By this time, our policymakers were running out of options. There was some respite as the UK, freed from the shackles of the ERM, performed a little better than most of our European partners. But we had long since surrendered ourselves to the belief that we could no longer – in the face of newly competitive developing economies – compete as a manufacturing economy. Instead of addressing that problem, and exploring appropriate remedies for it, however, we determined to find an alternative way of paying our way. I was the Opposition spokesperson on financial matters in 1986 at the time of the so-called Big Bang – the removal of effective regulation from City institutions – and had led for the Opposition in the Committee stage of the Financial Services Bill. I had argued in vain that self-regulation would be ineffectual in restraining excesses and maintaining prudential supervision. 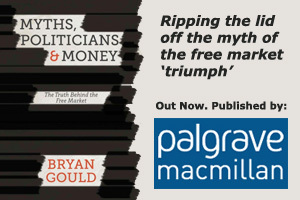 But an essentially unregulated financial services industry was – with heroic optimism – advanced as the ideal substitute for our declining manufacturing; it had the advantages of requiring a great deal of capital (which could not be replicated because it was not at that time available to most developing economies) but little by way of real skill, and it also offered the political bonus to Thatcherite politicians of disabling the large industrial trade unions. These dazzling prospects seemed for a time to be delivered. As recently as 2007, and as evidence of how thoroughly New Labour welcomed these developments, Gordon Brown, in his annual Mansion House speech – his swansong after a decade at the Treasury – heaped praise on the financial services industry developed by the City of London, and predicted that “it will be said of this age, the first decades of the 21st century, that out of the greatest restructuring of the global economy, perhaps even greater than the industrial revolution, a new world order was created”. We now know, courtesy of the global financial crisis, that financial services did not provide the secure base for economic development that had been hoped for, and that such benefits as were delivered went in large volumes to a very small proportion of the population. Even more seriously, our neglect of manufacturing as a wealth-creator has meant that we are denied the great advantages that manufacturing alone can deliver – as the most important source of innovation, the most substantial creator of new jobs, the most effective stimulus to improved productivity and the provider of the quickest return on investment. George Osborne, and his dwindling band of supporters, seem bereft of any understanding of this sad history. Their insistence on austerity as the cure for recession is just the latest instalment in a total refusal by a long succession of Chancellors to face the reality of our long-standing difficulties – so that we are now facing the probability of permanent economic decline. We now seem to have run out of options. We have tried qualitative easing and low interest rates, apparently unaware that using monetary policy to promote recovery is like pushing on a piece of string. We reject an expansionary fiscal policy in favour of cutting spending, refusing to acknowledge that this has meant, inter alia, a larger rather than a smaller deficit. Even if we now wished to take the commonsense path, and focus on rebuilding our long-neglected productive industries, we would find that we have lost much of the technological lead, the workplace skills, and the available markets that were once ours. Without the political will to change tack completely and to plan and make provision in the long term to rebuild our industrial strength – learning to think, in other words, as a developing economy and eschewing short-term fixes – the future looks grim. George Osborne, in other words, is heir to a long and dishonourable tradition. He is not the only person who must carry the can. But the immediate challenge is not just to escape from recession but to recognise and deal with the long-term problems. The Chancellor has shown that he is not the man to do it.